Wash and drain the rice. Add 1 ½ cups of water for each cup of rice and soak for 30 minutes. Bring to boil, cover and simmer for 20 minutes. Remove from heat. Sprinkle with the miring and brown rice vinegar and leave to cool for 20 mins. Place the sushi nori on a bamboo mat at the edge nearest to you and spread the rice evenly over 2/3 of the nori with the uncovered part facing away from you. Add your fillings on top of the rice, slightly off centre. 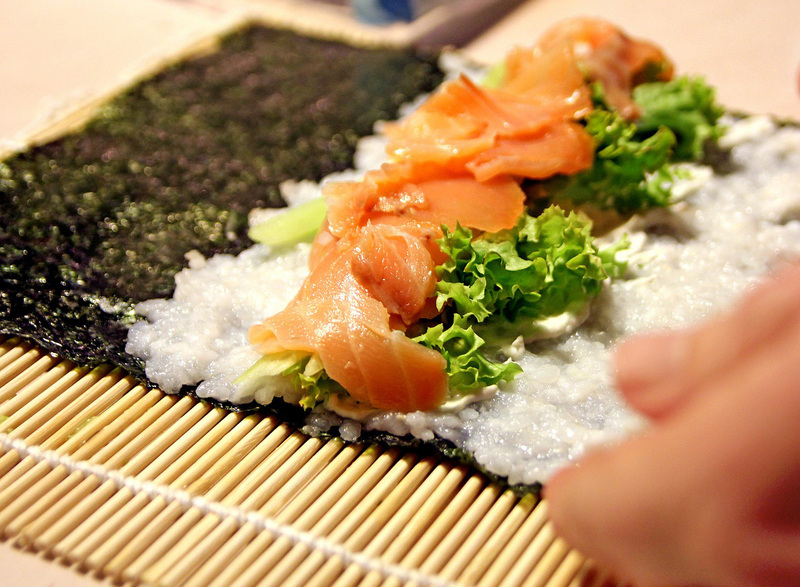 Roll the bamboo mat slowly, start by tucking in the end of the sushi nori nearest to you. As you roll further, press lightly with both hands. Just before you reach the end, dab water along the open end and then press to seal the roll. Carefully remove the roll from the mat and cut into approx. 6 pieces, using a lightly moistened sharp knife. Repeat the above steps with the remaining 4 sheets of sushi nori.